JPEG 2000 is a wavelet-based image compression standard. It was created by the Joint Photographic Experts Group committee with the intention of superseding their original discrete cosine transform-based JPEG standard. The file extension for this format is .jp2. JPEG 2000 can operate at higher compression ratios without generating the characteristic 'blocky and blurry' artifacts of the original DCT-based JPEG standard. It also allows more sophisticated progressive downloads. Part of JPEG 2000 has been published as an ISO standard, ISO/IEC 15444-1:2000. JPEG 2000 is not yet widely supported in web browsers, and hence is not generally used on the World Wide Web. 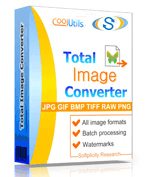 If you would like to convert JPEG2000 to TIFF, JPEG, BMP, PNG try Total Image Converter. It converts images in batch, crops, rotates and watermarks them at one go.